"Even a child can see the difference," said the chief. Find out what he meant in our March newsletter. 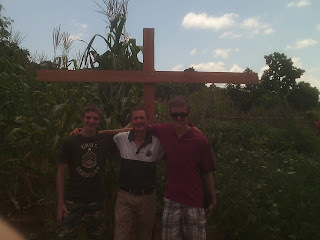 Thank you for your interest in helping us spread the message that Jesus Loves Malawi! Charitable giving receipts can be issued both in Canada and the U.S.
Find “Malawi A1 (D. Babcock)” in the drop down menu labeled "Fund." Then just simply fill in the form and submit. Your online donation will be processed and receipted by Canada Helps, and forwarded to ACCI for our support. (Canada Helps is a registered charity which serves other charities by processing online donations on their behalf). [Post dated cheques are also acceptable for monthly gifts - see next section]. If you need any help at all getting set up, Lauren at ACCI would love to guide donors through the internet setup, which is very secure, and not terribly complex. Lauren's phone # is 613-298-1546. To Mail a Cheque: make payable to ACCI, and include a note designating your gift for project “Malawi A1 (D. Babcock)” in the memo. (Our names should not appear on the cheque). Designated funds given to the named project will be assigned to the project; however, ACCI reserves the right to apply donations to other projects as it deems appropriate. Giving can be done by phone, by mail, or online. [Both one-time and monthly gifts can be set up by any of these methods]. To give by Phone: call 1-800-478-8963 with account information handy (either checking or credit card). To donate online or set up monthly donations online visit https://www.tms-global.org/give. Specify the amount, and enter either our I.D.#: 3054, or “Dean and Stephanie Babcock.” When you click on “Give” you’ll be taken to the online form where you can enter all your giving information. We need more than monetary support, however, so don't forget to send an email to JesusLovesMalawi@gmail.com requesting to be put on our Prayer Letter list. And, of course, don't forget to pray! May God bless you!